This is a small machine intended for the grower of small quantities of rice paddy, and for domestic use. It replaces a model called the Paddy Pounder. Paddy can be shelled at a maximum rate of about 30 pounds (14 kilograms) an hour, but the capacity may vary considerably depending oil the type of rice and its condition. The machine has three adjustments controlling the feed, the discharge, and the hulling knife, A perforated plate allows dust to escape, and the machine can be opened easily for cleaning. •Strongly made, its net weight is 23 pounds (10.5 kilograms), and it is provided with holding-down screws and spanners. John Gordon & Co. (Engineers, Ltd.) 196a High St.
Epping, Essex CM16 4AQ, U.K.
250 kilograms per hour with 00 percent hulling efficiency. Net weight: 60 kilograms. Operated either by hand or by a \/x h.p. 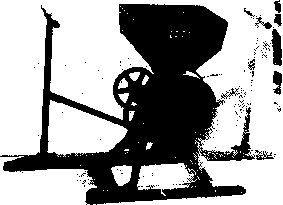 motor, the Tyoe E Polisher will polish unhulled rice that has already been dried and winnowed. Capacity is 10 to if; kilograms per hour by hand, and 80 kilograms with a motor. 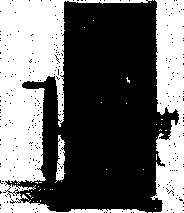 Weight: 22 kilograms. rice, unhulled paddy rice and immature rice, mud, and sand. It may also be used to sort polished rice for grading. These power-driven machines can be used as hullers alone or supplied with polishing attachments. Three models are available, requiring 5, 12, or 15 h.p. They will hull rice from the paddy or shelled rice. From the paddy, the smallest luiller will produce 86 to 45 pounds of cleaned rice; the middle, 136 to 201 pounds; the largest, 250 to 295 pound!» per hour. When using shelled rice, production capacity is a little less than double those amounts per hour. Grantex Rice Huller Lewis C, Grant, Ltd.
Lewis C. Grant, Ltd. Eau Quality St., Dysart Kirkcaldy, Fife, KYI 2UA U.K.
target models are available, either in cabinet or strip enclosures. Efficiency ranges from 300 to 1,000 kilograms per hour. None of the Iseki models include their own power units. CeCoCo, with its wide variety of all types of machines, offers seven automatic rice processors, with many sizes of each type. Their automatic hullers feature rubber rollers, which they claim will increase output recovery of hulled rice 15 to 20 percent. They also recommend that rubber-rolled rice be stored and shipped as brown rice, with any polishing to be done at the destination of the shipment to avoid deterioration of the product. 1. Rubber Roll Rice Huller: The original model consists of a hulling head and installation bed. Separation of brown rice and husks is necessary. Seven models are available, ultilizing 1 to 10 h.p. or V-belt drive; capacities range from 500 to 4,000 kilograms per hour in paddy. 2. Combination: Three models, with or without suction husk exhaust, are offered. 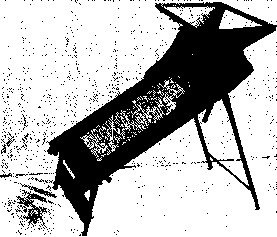 The basic unit includes a hulier and husk winnower. The suction exhaust model is recommended for use in buildings. The three sizes utilize from 2 to 5 h.p., with capacities ranging from 500 to 2,000 kilograms per hour. 3. Automatic KL-A: This self-contained unit include* hulling head, winnower, double elevator, separator, ami rice elevator. The smaller model requires 4 to 5 h.p. and produces 600 to 700 kilograms per hour; the larger requires 5 to 6 h.p. and produces 1,000 to 1,200 kilograms per hour. 4. Automatic AM and ME; These are miniaturized versions of the complete unit, suitable for a single farmer or a group of farmers. The one-body construction includes huller, winnower, and separator. The Nogueira Rice Mill husks and polishes rice, then separates polished rice, husks, rice bran, and broken rice. It will utilize a 3 h.p. electric motor, a 6 to 9 h.p. 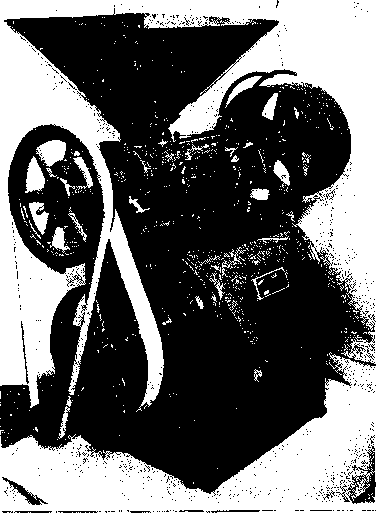 gasoline motor or a 5 to 8 h.p. diesel-otl motor. Production capacity is approximately 2 sacks (60 kilos or 132 pounds) per hour. The cabinet is metal and weighs 236 kilograms. Powered by flat belt-drive pulley, this 3 h.p. 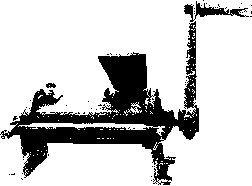 machine will, in a single operation, hull, scour, and polish rice as it is received from the thresher. An optional built-on exhauster is available to carry away chaff and dust. This item is suggested for small mill operators or larger growers. The No. 3 has a capacity of 80 to 100 pounds of rough rice per hour, and two larger models are capable of up to 700 pounds per hour. Similar in design to the No. 3 Rice Huller and Polisher, the No. 4 does not contain the polisher attachment. Two larger models of hullers are also available. To the practitioners of today's chemical agriculture, a fertilizer is a substance that has a measurable quantity of at least one of the major nutrients required by growing plants. The most widely used chemical fertilizers are those which contain three primary plant nutrients: nitrogen (N), phosphorus (P), and potassium (K.) in varying combinations. Organic growers, on the other hand, rely on natural fertilizers to maintain and replenish all the elements in their soil that are necessary to plant growth. They view soil fertility as a broader, more complex concept which involves not only specific plant nutrients, but also organic matter, the living organisms present in the soil, and the very structure of the soil itself. To them, humus content and tilth are important aspects of soil fertility. Unlike those farmers who employ chemical fertilizers to supply their crops with specific nutrients in forms that are readily available, organic fanners use a variety cf natural materials to maintain and improve overall soil quality. In this way, soil fertility and health are improved even as crop yields increase. Mute-Drawn Manure Spreader Reading Eagle, Lancaster County, Pa.
ing organic materials to the soil. Originally, manure was spread over the soil surface from a cart, with a many-tined pitchfork called a manure fork. Then came the development of the manure spreader, a horse-drawn cart with a ground-driven set of chopping blades in the rear. Manure fed into the blades was chopped into small pieces and evenly distributed onto the field. Most manure spreaders made today are designed for pulling behind large tractors beyond the scope of this book. They are easy to locate through most agricultural equipment dealers. Farm auctions are the best source for smaller units in North America. One company to appear with a mini manure spreader, requiring only the power of an 8 to 12 h.p. tractor, is Uebler. Their smallest model has a capacity of 18 bushels which it distributes under power from its own 4 h.p. gasoline engine or a power take-off shaft. Their next size larger has a 50-busheI capacity. Uebler Mini Manure Spreader Uebler Manufacturing Co. The smallest manure spreaders put out by New Idea are a 138-busheI model with the combined chopping action of a cylinder and paddle, and a 146-bushel, single-beater model. welded around the beater pipe in two opposing spirals. This beater will tear apart the toughest manure, whether it is from a feedlot or pen, even if it is fro/en. Strings don't catch or hang on this beater as they do on others. A lower-splash blade beater has the specific purpose of breaking up and scattering both liquid and clumps. This lower beater is particularly useful if you are spreading on a hay field or some other place where large lumps could smother patches of a crop. of the sliding pusher; the other part extends out over the tractor hitch. The entire inside of the box is lined with tough plastic. Manure does not penetrate or stick to the plastic, nor does it freeze to plastic as it does to wood or steel. 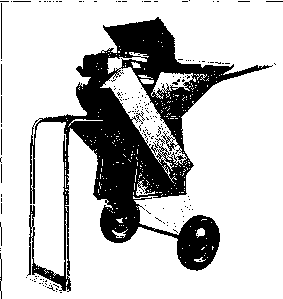 Charles E. Fox, of Jonesboro, Louisiana, has invented a spreader wagon that hitches to a tractor and distributes material such as pulverized chicken fertilizer, sawdust, or ground bark. 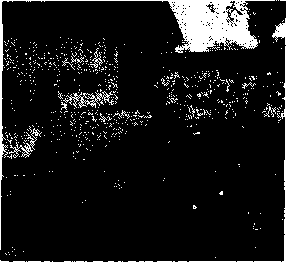 It is a two-wheeled cart with a series of arched platforms in its bed that funnel material onto a conveyor belt, and then through, a gauging or measuring device. The gauge limits tiie amount of material laid per foot. The belt can be disconnected for transport. Mr. Fox is currently seeking a manufacturer for his spreader with the help and guidance of the Raymond Lee Organization His invention, covered by a patent application pending in the United States Patent Office, is designed primarily for organic farmers.